There is no normal pattern for bowel movements. Some people have about one a day, but others may have as many as three. Generally, you can consider yourself constipated if you pass less than three stools a week for a minimum of three of the last six months and strain when passing. While practitioners of alternative medicine recommend herbal laxatives, such as aloe, to relieve constipation and irregularity, evidence of its efficacy and safety is complicated and inconclusive. Constipation can result from a variety of causes, including lack of exercise, insufficient intake of water and dietary fiber, chronic use of laxatives, stress, and other physical factors. Additionally, when your colon muscle contracts too slowly, waste takes the slow road through the digestive tract, creating hard, dry stools. Though irregular bowel movements and constipation may cause discomfort, they generally do not indicate a serious health issue. The Mayo Clinic website cautions, however, that you consult your doctor if severe symptoms continue over a period of more than three weeks. Outside of the United States, aloe is considered a fast and effective remedy for gastrointestinal complaints. Drs. Joseph Pizzorno and Michael Murray, naturopathic physicians and authors of the "Textbook of Natural Medicine," claim that aloe juice is a potent and effective stimulant laxative. Its fluid is drawn into your stool, making it softer. 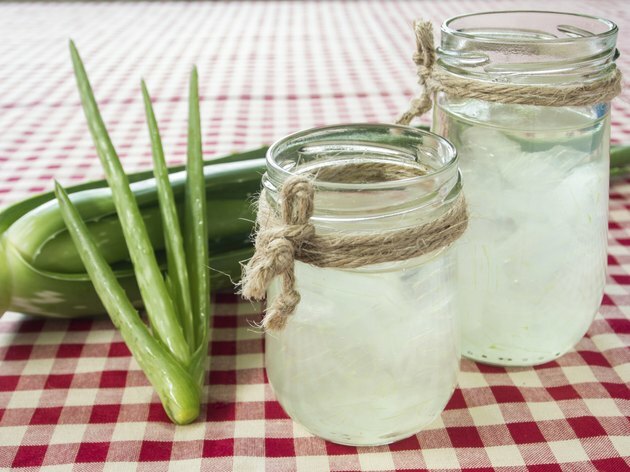 Additionally, small doses of aloe juice, contained inside the skin of the plant's leaf, help the digestion of protein and strengthen your body's intestinal musculature, easing constipation and irregularity. In comparison to other herbal stimulant laxatives, however, such as senna or cascara sagrada, larger doses of aloe juice draw less fluid into your large intestines, making it less likely to cause dehydration, diarrhea and cramping. Taking aloe juice for more than two consecutive weeks can result in loss of electrolytes, especially potassium. Aloe laxatives can interfere with absorption of prescription medication, so take them at different times. Women who are pregnant or menstruating should avoid aloe juice. Furthermore, the laxative compounds contained in aloe pass into mother's milk, so nursing women should not take aloe internally. While Commission E -- Germany's regulatory agency for herbs -- approves aloe as a treatment for constipation, in 2002, the U.S. Food and Drug Administration issued a ban of aloin, the yellow sap of the aloe plant used as a laxative ingredient. According to the American Cancer Society, the sale of aloe products as nonprescription drugs for treatment of constipation was banned due to the lack of evidence of its safety and effectiveness.